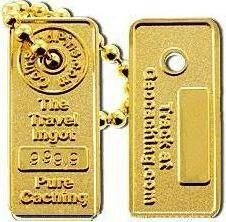 (TB2H8RE) Travel Ingot Geocoin - Todies Wild Ride: Can you see me now? Todies Wild Ride: Can you see me now? In the hands of duzer51. Use TB2H8RE to reference this item. All of us who ride Motorcycles also need to be aware that other drivers cannot or will not be able to see you when you're riding. Cars and Trucks are bigger than you - give THEM the right of way whenever you can, otherwise, they are likely to take it from you and that can be very dangerous! When approaching intersections, "pretend" that the other vehicles there cannot see you! Pretend you are INVISIBLE to them! This can save your skin as well as the rest of you. Always think "He's doesn't see me. He's looking right at me, but he doesn't see me." Better safe than sorry. SLOW DOWN - Speed can kill, especially on a motorcycle! 1) You can see better - there's no car frames, door jambs, etc. for you which means less blind spots - but you have to LOOK and ALWAYS be aware of your surroundings. Who's next to you, who's going to cross in front of you? 2) You are more maneuverable than cars - learn to use that maneuverability to escape possible misshaps. Remember, you can stop faster, turn quicker and change lanes in 1 second! BUT, make sure you have an "out" - always keep an eye out for zones you can move into quickly when needed. Never allow vehicles to ride next to you - they block your 'out' zone and never drive in someone's blind spot - it's hard enough for them to see a car there, they won't see a bike! Gallery Images related to Todies Wild Ride: Can you see me now? This bug has traveled over 11,000 miles so far! As the owner, I would love to see it hit each and every state in the USA! Currently in Florida, I would like to see it travel the Gulf Coast... Please be sure and read the logs and contribute YOUR motorcycling for safety tips and/or stories. Very nice geocoin with a very admirable mission. Unfortunately, I have been unable to locate a cache in the past 5 months. Therefore I have transferred this geocoin to mscoutsfan, a seasoned geocacher, in order to put Todies Wild Ride back into the geocaching circuit. This entry was edited by duzer51 on Monday, 29 October 2012 at 04:37:38 UTC.